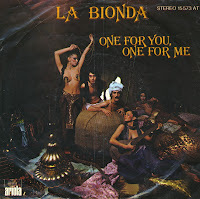 La Bionda was formed by Carmelo and Michelangelo La Bionda in the early Seventies. They had their biggest successes in the second half of the Seventies, at the height of the disco craze. 'One for you, one for me' was released in the summer of 1978 and reached number 6 in the Dutch Top 40 and number 54 in the UK singles chart. The B-side, 'There for me', became a classic in its own right, having been covered by artists such as Sarah Brightman, Hayley Westenra and Paul Potts.